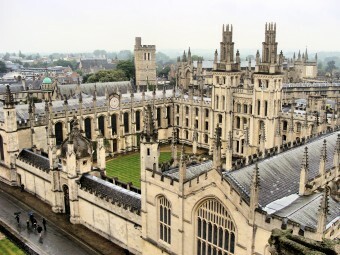 Oxford University is well known for being one of the most prestigious and elite places of learning in history. Over the years, it has seen some of the finest minds the world has ever known pass through its halls. It’s also the place where over six centuries ago a bunch of students and a fair number of townsfolk were killed in a riot over a pint. While many details about what has come to be known as “The St Scholastica’s Day Riots” have been lost, and others are occasionally conflicting given the documentation of the day (which is perhaps not surprising when reading accounts from two groups that detest one another), we do know more or less how events transpired. For starters, in every reputable account, the riots began on the 10th of February 1355, which just so happens to be known as “St Scholastica’s Day”- a day of feasting meant to honor St Scholastica, the sister of the perhaps more well known St Benedict. On that day, a number of Oxford students were drinking at an establishment called the Swindlestock tavern (a.k.a. Swyndlestock Tavern) when two of the students began complaining about the quality of the ale on offer. Exactly who these students were isn’t known for certain, but they are commonly claimed to have been named Walter Spryngeheuse and Roger de Chesterfield. Whether that was really their names or not, the students were extremely dissatisfied with the quality of the alcoholic beverages they’d been served and complained to the landlord, supposedly named John de Croyden, directly. Allegedly, the landlord responded to these complaints with “stubborn and saucie language” which, if you’ve ever been in a pub, is probably how approximately 99% of all landlords would react to being rudely told their drinks taste a bit like pigswill. The students, not liking the landlord’s attitude, decided that they’d express their displeasure by hurling their tankards directly in his face. What happened immediately after isn’t clear. But eventually, the infuriated landlord roused the local populace by ringing the town church’s bell which in turn caused the students to do the same with the bell located in the university’s church, with both sides rallying. Soon after, a riot erupted between the two groups when arrests against the two initial instigators were attempted. The riots quickly grew out of hand including an estimated two thousand additional townsfolk joining the fray after rumours of the riot and the sound of ringing bells reached the countryside. Bouts of violence involving bows, arrows, swords, axes and, of course, fists continued well into the night and the next day. Ultimately, the townsfolk managed to storm the university grounds and kill 63 students, as well as injuring many more. The students, in turn, reportedly managed to kill upwards of 30 or so townsfolk during the melee. In fact, only a little over a century before, another riot between the Oxford students and the townsfolk had started after students murdered a townswoman. Some of the students fleeing the ensuing riot ultimately helped found the University of Cambridge, today the second oldest university in England after Oxford. Beyond more or less being above the law, the students were also exempt from being able to be sued in court outside of their diocese, as well as exempt from paying certain taxes. Needless to say, from the beginning up until somewhat recently in history, significant clashes between Oxford students and the surrounding townsfolk were relatively frequent. The university and its students were able to get away with all this because, at that point in history, Oxford was essentially another arm of the Church, meaning its power was pretty much absolute. This was no better proved than when King Edward III caught wind of the riot and instead of trying to get to the bottom of what happened, he decided instead to impose harsh penalties on the entire town and arrest any citizen he felt had something to do with the riots. On top of forcing the mayor to beg forgiveness on behalf of the townsfolk every year for just under half a millennium, the university was also initially given control of certain trade in the town, including the trade of wine and beer. So, in the end, by all appearances it would seem it was the landlord’s fault for not brewing better alcohol and then having the audacity to have his face get in the way of the thrown drinks by the Oxford students. This post originally appeared on TodayIFoundOut.com as written by KARL SMALLWOOD.